This amphibious car was designed by Hans Trippel. It has a unibody steel two-door cabriolet body with electrically-welded joints and is powered by a 1147cc triumph herald engine mounted at the rear and driving the rear wheels. Two propellers are activated for propulsion when the car is in the water. Top speed is about 6 ½ knots ( 7mph) in the water and 68 m.p.h. on land. The front wheels are used as rudimentary rudders for steering in the water. Of 3,878 made, 3,046 were imported to the U.S., and the rest were sold around Europe. 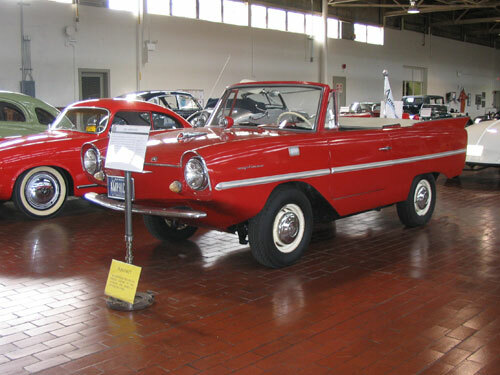 The Amphicar was the most successful amphibious car ever produced, and has the highest tail fins of any production car, one inch higher than a ’59 Cadillac!